Once again, World Tea Expo attendees will have an opportunity to share in the wacky (and occasionally educational) world of professional tea bloggers. 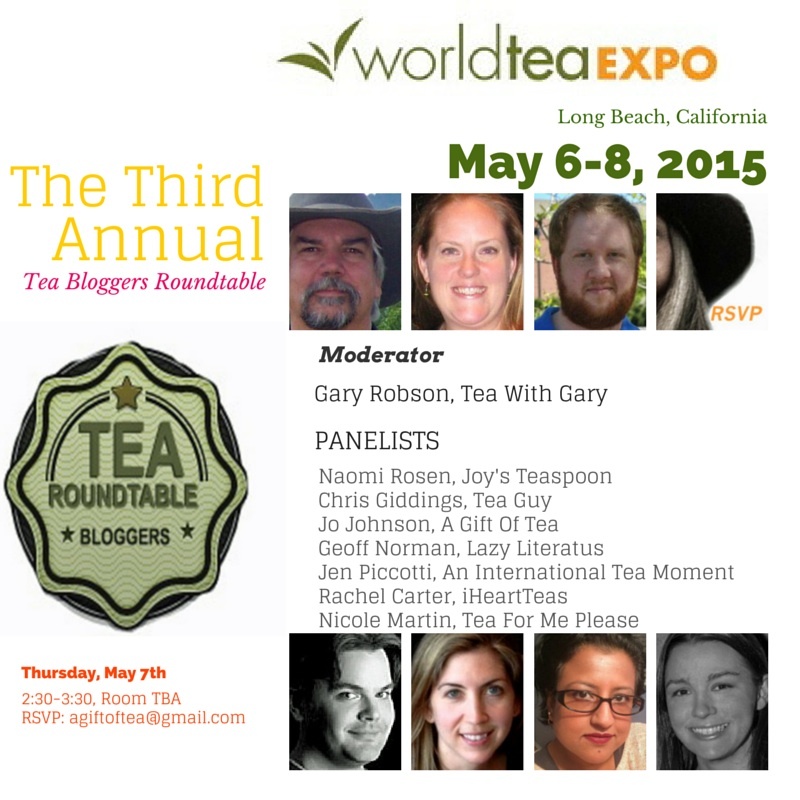 You’re all invited to the Tea Bloggers Roundtable 2:30 to 3:30pm on Thursday, May 7. It will be a panel discussion featuring some of the names tea aficionados just might recognize. The panel will consist of Rachel Carter (iHeart Teas), Chris Giddings (Tea Guy), Jo Johnson (A Gift of Tea), Nicole Martin (Tea for Me Please), Geoffrey Norman (Lazy Literatus), Jen Piccotti (An International Tea Moment), and Naomi Rosen (Joy’s Teaspoon). I’ll be moderating the panel, which has the theme this year of “Melding of Voices.” I know, all of those names are in that poster image right below this paragraph, but I wanted to include links to all of the blogs. Check us all out before the event! One of the things I enjoy most about the world of tea blogging is the lack of competition. I don’t find myself thinking “oh, no, Geoff scooped me on that story,” or “how can I get more viewers than Robert (Lord Devotea’s Tea Spouts) this week?” Instead, we read each other’s posts; we talk about each other’s stories; we link to each other’s blogs; we gain inspiration from each other. We’re not in it to beat each other at the game. We’re in it to share our love of tea and each be the best we can be. Our blogs all have different themes, too. Some of us just do tea reviews. Some talk about gadgets. Some are very professional in tone; and some are very personal. Some talk about the tea business, and some prefer to just focus on the tea itself. Some blogs, like mine, are all over the map. That’s what makes the tea blogging community such a great environment for newcomers. Speaking of past events, here’s a candid shot from last year’s Roundtable. I’m the big dude on the right. It really gets to be fun when we open things up to questions from the audience, and that’s where we find out just how many people in the tea business are interested in blogging. In addition to the prepared questions, if past roundtables are any indication, we’ll also be dealing with questions like how to choose topics, how to get tea to review, the Association of Tea Bloggers, whether to schedule posts, what social media sites work best for promotion, the difference between a hobby tea blog and a professional tea blog, and much more. If you have a conference badge, there’s no additional cost to attend the Tea Bloggers Roundtable, so take advantage of this opportunity to hobnob with experienced tea bloggers, writers, and social media marketers. If you have questions, contact Jo Johnson at agiftoftea@gmail.com. She’ll take care of everything! And just in case you haven’t had enough nostalgia, here’s the 2013 Tea Bloggers Roundtable. I wasn’t on it back then, so they had to add three extra people to compensate. While writing this blog post, I was drinking a Vietnamese black tea called Good Morning Vietnam! I brewed this cup for 3:00 using boiling water. As usual, I did not add milk or sugar. Although this is a typical black tea in most ways, there is very little astringency. I don’t think your typical half-tea-half-milk breakfast tea drinker would find it overly satisfying, but it’s turning into my new favorite black tea. Posted on 23 January 2015, in Tea Biz and tagged A Gift of Tea, An International Tea Moment, Chris Giddings, Geoffrey Norman, iHeartTeas, jen piccotti, Jo Johnson, Joy's Teaspoon, Lazy Literatus, Naomi Rosen, Nicole Martin, panel, Rachel Carter, Tea Bloggers Roundtable, Tea for me Please, Tea-Guy, Vietnam, Vietnamese black tea, World Tea Expo. Bookmark the permalink. 3 Comments. Last year’s round table was so much fun and I’m really looking forward to doing it all over again. The audience Q & A was a highlight for me, especially since many of them were bloggers I’ve “known” online for years but never met in person. I love the sense of community that we have in the tea world. Bloggers in other niches don’t always have the benefit of such comradery. I wholeheartedly agree, Nicole! I think we have a great theme to go with this year, too. Can’t wait to partake. And as far as I know, I don’t think I’ve beaten you to anything overly important. Although, you have beaten me to unusual heicha.